Ok... 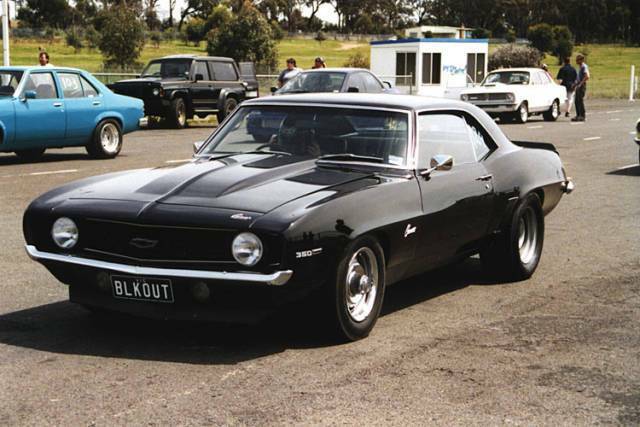 Here is a good brain teaser for you camaro "enthusiasts" and more than likely a piece of cake for you "experts"... either way I myself dont know the answer. Break out your 1968 assembly manuals, and give me your opinions or shed me on a few facts. 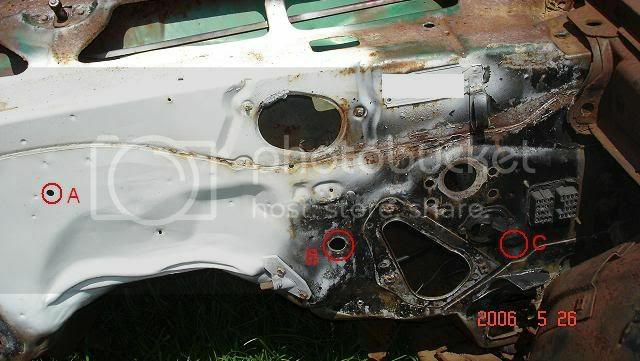 Below i have posted a picture of a section of the firewall area of my 68... 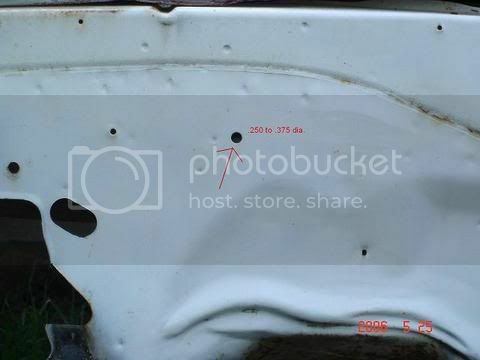 It is a possible L30/M20 car as it has the valve on the frame and a few other odds and ends... but anyways there are 3 holes labeled on my pic.. what were they for? Im just confused about hole "B" At first i thought it was hole 3C on AM UPC 0 Sheet A8.5 but holes 3A and both 3B holes are not there. Hole "C" is where the origional speedometer pierced the firewall. Ant and all help and opinions are apperciated. I wist to restore this car to its origional state and have very little to go by but i want to make it as correct as possible. Thanks in advance! The "A"-hole (hehe) appears to be correct for the U17 console oil gauge. The "B" -hole is one of the M20 hole locations and should be 0.920-0.940" (~15/16") in diameter according to my 1969 manual. However, I cannot find anywhere within my manual when this speedo location would be used. The "C" -hole is the regular production speedo cable hole. Here the cowl & panel hole piercing page of my 1969 assy manual. Item #8 points to the "B" hole's location. The description is RPO M20, but nowhere can I find it within any of the RPO tranmission chapters or even UPC 12. "A" is for a sheet metal screw to attach the ground strap (rpo U63) to the firewall. The oil line hole is higher, and more toward the center (not drilled in this picture). "B" is for the back-up light harness grommet. "C" is, of course, for the speedo. cable. It seems that "A" is a little to big for just a ground screw... but mabye it was... if it was it wont be the first "screwey" thing i have found with this car LOL... thanks all .... still open for opinions! Ok, the smaller hole to the left is for the ground strap. That hole is for the rubber firewall insulation fastener. JohnKY that more understandable.. but how come there is no mention of the hole in the hole piercing chart in th AM? I think the firewall piercing page only covers RPO's. Holes that are present on all bodies are not noted.